Highland House was built by the current owners on the site of a farmhouse in the Georgian style, and the project has only recently been completed. With a superb welcoming entrance to the property with timber floor, the property offers stairs to the first floor and doors leading to the two main reception rooms, which are the drawing room and dining room, both of which have timber flooring, marble open fireplaces and attractive decorative cornicing. The snug has French windows to the terrace. Thr property has an exceptional kitchen/breakfast room, fitted with an extensive range of units under hardwood Iroko wood work surfaces, also with French windows lead out to the terrace, which is a wonderful outdoor area with slate tiled flooring. The ground floor also has a utility room, cloakroom and boot room. Stairs from the hall lead down to the lower ground floor, which is devoted to leisure and a fine space for entertaining. There is a games/party room with a bar area. This room is ideal for parties and dancing and easily accommodates a band. Attractive coach-house style doors lead to an outside gravelled lower terrace. Also on this floor is a cinema room and a gym and adjacent shower room and a “services” room. Easy-rising stairs from the reception hall lead to the galleried first floor landing with access to the master bedroom suite, which enjoys far-reaching views from the bedroom and bathroom. On the first floor are three further bedrooms, each with en suite facilities, also fitted with exceptionally high quality sanitary ware. Stairs from the landing lead to the second floor where there are two proposed further bedrooms, each with adjoining space intended to for en suite facilities. Outside, below the house is an attractive courtyard of buildings comprising some former stabling and garden stores. These buildings have scope for conversion into superb stabling. The landscaped gardens lie mainly to the front of the house and comprise areas of lawn with flower and shrub beds. The driveway is flanked by young conifers. The land surrounding Highland House extends to about 13 acres with Lot 1 or 33 acres with the sale of the whole. The land contains a mixture of permanent pasture and pockets of deciduous woodland. Access to the land can be gained off the main private drive, which leads to the house. There is a pole barn situated above this entrance drive to the property which has great potential to be replaced (subject to the relevant consents) with a general purpose shed which could be utilised for stabling or for housing sheep and cattle. 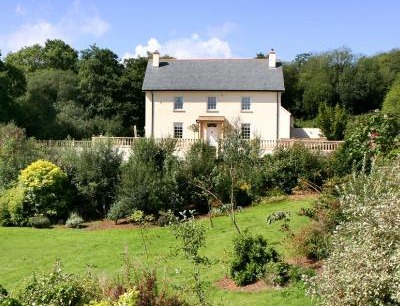 Highland House is situated close to Crediton and to Exeter.